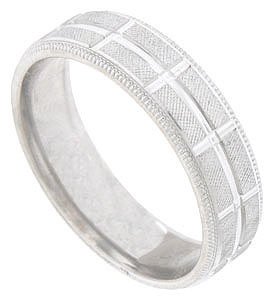 The rough carved surface of this 14K white gold mens wedding band is interrupted by a deeply carved stripe running down the center of the band. Wide spaced vertical stripes cut through the central channel from edge to edge. Distinctive milgrain frames pattern on either side. The antique style wedding ring measures 6.11 mm in width. Size 10. We cannot re-size, but we can reorder in other sizes. Also available in 18K, yellow gold, platinum and palldium. Contact us for current market cost.